Intel® Omni-Path Fabric Edge Switches,an element of the Intel® Scalable System Framework, are part of an end-to-end product family for HPC fabrics that delivers high performance with breakthrough value-Intel® Omni-Path Architecture (Intel® OPA) builds on proven technologies from Intel® True Scale Architecture, the Cray Aries interconnect, and open source software to provide an evolutionary on-ramp to revolutionary new fabric capabilities. Intel® Omni-Path Edge Switches deliver 100 Gbps port bandwidth with latency that stays low even at extreme scale. 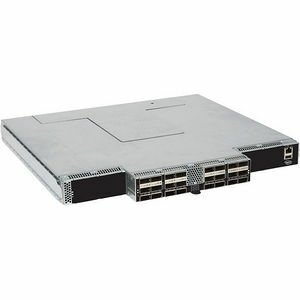 Second generation Intel fabric switch silicon, with market leading 48port radix, these switches can lower fabric acquisition costs by as much as 50 percent, while simultaneously reducing space and power requirements. i With these savings, you can potentially achieve higher total cluster performance within the same hardware budget to expand and accelerate your research. Intel® Omni-Path Fabric Edge Switches support HPC clusters of all sizes, from entry-level systems to supercomputers with tens of thousands of server nodes. You can use these switches in combination with Intel® Omni-Path Director Class Switches to build low-latency, multi-tier fabrics with an exceptional set of features for high-speed networking. Intel® Omni-Path Fabric Edge Switches provide integrated support for high availability with advanced features such as power, component-level diagnostics and alarming, and out-of-band management. Innovative features take fabric resilience and availability to new heights without sacrificing performance.Packet Integrity Protection (PIP), for example, provides high packet reliability with latency-free error checking and link-level recovery. Dynamic Lane Scaling (DLS) maintains 75 percent of linkbandwidth if a physical lane fails, so HPC workloads can complete gracefully to keep project efforts on track.